Unrealistically high expectations set the consumer products titan up for a steep fall last year. Kimberly-Clark (NYSE:KMB), the consumer products giant behind blockbuster global brands like Huggies diapers and Kleenex tissues, badly trailed the market last year. Shares declined by 10%, compared to a 10% increase for the S&P 500 and a 6% gain for rival Procter & Gamble (NYSE:PG). Below, we'll explore why the stock stumbled last year while looking at its prospects for a brighter 2017. Kimberly-Clark started off with solid growth. In early January it announced that fiscal fourth-quarter organic sales jumped 5% as emerging markets spiked 9% higher. That was enough to put the company at the top end of its target of between 3% and 5% organic gains for the full year. P&G, by contrast, grew by just 2% in its most recently complete fiscal year. The strong momentum gave CEO Tom Falk and his executive team confidence going into the new year, which showed up in its official forecast. Kimberly-Clark initially targeted between 3% and 5% sales growth in 2016. Cost cuts, meanwhile, were seen helping profitability rise so that adjusted earnings improved to as much as $6.15 per share, up 7% from the prior year. However, halfway through the year it became clear that the company had been too optimistic about its assumptions. In its second-quarter announcement, the company lowered its organic growth outlook to 3% as the business struggled under the weight of a demand slowdown across some of the biggest markets in the industry. Then, in its October quarterly report, Kimberly-Clark pulled down its full-year guidance yet again, to its current forecast of just 2% organic growth. "I am not satisfied with our top-line results," Falk told investors at the time, even though the management team was encouraged by the fact that the company held or improved market share across nearly all its product categories. Procter & Gamble seems to be the beneficiary of at least some of those sales declines. The consumer products titan posted its best growth rate in years at its last quarterly outing, with organic sales rising 3%. Management cited improving market share for the Pampers diaper brand against Kimberly-Clark's Huggies as one driver behind the better growth. 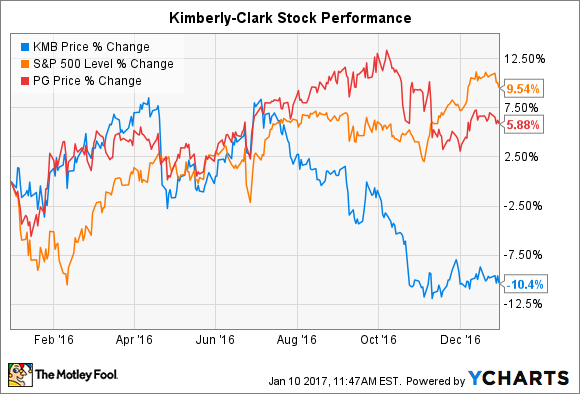 Kimberly-Clark is stumbling into 2017. Sure, it will likely announce an improvement over the prior quarter's flat sales result when it posts fourth-quarter results in late January. But organic gains should still be roughly 2% for the trailing 12 months, compared to a much healthier 5% at this time in 2016. As a result, shareholders will be eager to hear management's plan for sparking a sustainable rebound. That strategy should include cost cuts like the restructuring plan it announced in 2014 that sliced about $400 million out of annual expenses. Depending on their reading of the industry, though, executives might outline more aggressive measures, too. Something along the lines of P&G's brand-shedding initiative that removed 100 slower-growing franchises from its portfolio. The good news is that Kimberly-Clark's business is improving in key ways right now, including through higher operating margins, better cash flow, and spiking returns on invested capital. It matches up well against P&G as a dividend stock, too, given that the payout is growing in the mid-single digits while P&G's barely ticked up by 1% last year. The stock is likely to continue trailing its rival, and the market, though, until Kimberly-Clark can raise its sales expansion pace back up to levels that correspond with solid market share growth.